This free-form shape allows endless design possibilities for surrounding landscape concepts and water features. This range is perfect for smaller sites and areas where positioning of the pool is important. Add a manifold to the seating area at the pool construction stage and sit back and enjoy a wine or cool treat while your seat gets transformed into a relaxing spa, soothing those aching muscles after a hard day. The Kidney’s design focus was of our lifestyle, for all your leisure and family activities with children being the number one fans. 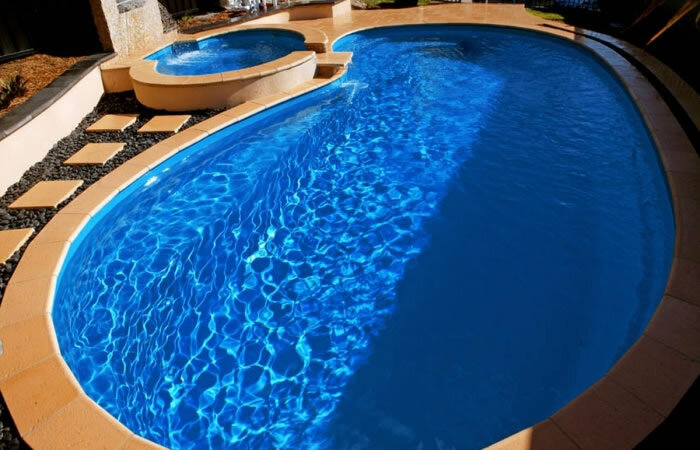 There are five sizes in their swimming pool range, from a value packed 4.9 up to a 9.1 metre pool. Large entry and exit steps give easy access with generous seating for socialising, while keeping cool. 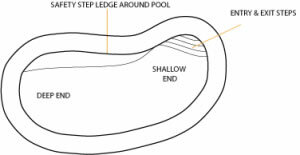 As with all Barrier Reef Pools, the Kidney pool design includes all of the usual safety features.